Welcome to a brand new blog post! Today, I'm talking to you about the new scrub that is available at all Lush stores. Double, double, boil and trouble. 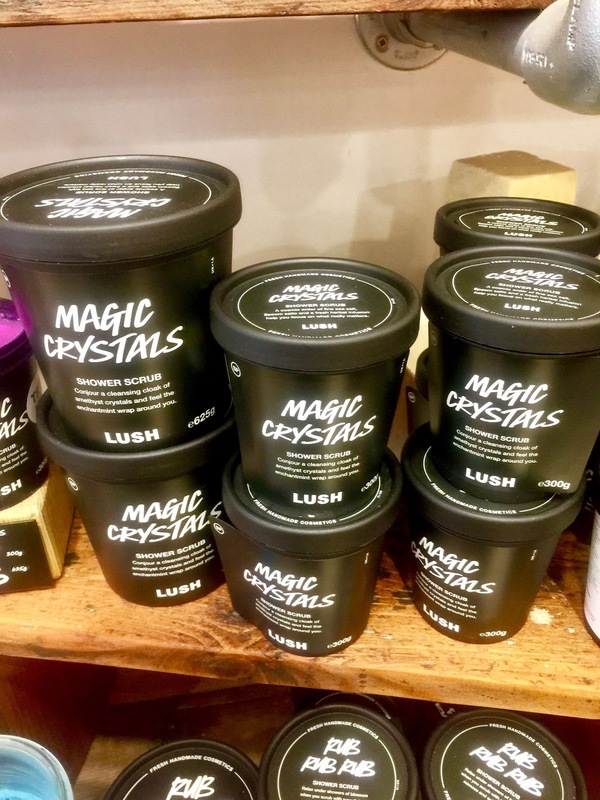 Keep reading to find out what I thought about the Magic Crystals Scrub. 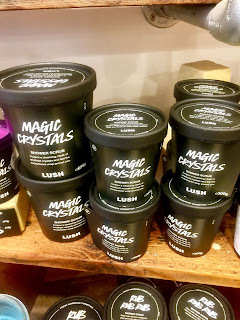 Lush have been bringing out a plethora of products, via avenues such as the Lush Labs platform that they have created online, but within the past week, they have released both the Vanillary Body Spray (comment down below if you want me to talk about that in a separate post0 and the Magic Crystals Body Scrub. I'm going to guess that this product is based around spells and Harry Potter, like their Secret Arts Jelly Bath Bomb. I thought that I would start off via talking about the ingredients. I know that this sounds a bit weird, but, I want to ensure that when it comes to beauty products and reviews, that I'm as informative as I can be. Fine Sea Salt and Epsom Salts instantly help to scrub away any dead skin that is on your body. The Mint infusion helps to invigorate and help you feel awake during the day. The Aniseed Oil helps to stimulate the mind. The Rosemary and Sage infusions ensure to cleanse and tone the skin which means that you can put the scrub on, moisturise and then go on with your day. When you instantly smell Magic Crystals, you get the Mint infusion, Spearmint Oil and Menthol Crystals. It reminds me straightaway of Intergalactic/Creme De Menthe Mouthwash. The Aniseed Oil adds a deeper scent to the Mint which makes it more pleasant, instead of wow too much mint in the morning. The Rosemary and Sage come through more when scrubbing it. The product is a sort of thick liquid cream texture therefore, you have to scoop it out, which can be messy if you just shove your hand in not knowing how much you actually need. When you scrub it on the skin, you can feel that it is a fine texture due to the Sea Salt. This means that, it gets into the nooks and crannies of your skin. Due to the Oils, after you have washed the product off, your skin feels really smooth. I have Dry Skin, which means that finding a good scrub is quite hard to do but this one worked well on my skin. I would recommend (and I will put this in bold for extra emphasis) like any Mint based product, please be careful if you use it on your private bits, as I can see this being ten times more extreme than a well known Mint Shower Gel. This product comes in two sizes. It comes in at £10.95 for a 300g Black Tub, or, £19.95 for a 625g Black Tub. Yes, this is expensive and I do think that it could be made in a smaller tub or slightly less expensive, but you do have to remember that you're paying for all of the amazing fresh ingredients and oils that go into a product. If you do want to stick to Lush for scrubs but think that this is on the expensive side, then you can always look at their solid scrubs. I think that for a scrub, it does it's job. I love the name of the product and I love the fact that it is a fine scrub, instead of the chunky ones that end up everywhere when you try to apply them. I personally love the Mint smell. I know that some won't, but, I love the Intergalactic Bath Ballistic, and I love the scent of this product! I do think that it's best to portion it up, mainly because, if you take the whole tub into the shower or bath, then I can see it getting messy. I do think that the price is a bit on the pricy side, but liquid scrubs do last a long time, so you'll definitely get your moneys worth! Check out Lush for all of your fresh Skincare needs. I hope that you have enjoyed this post and I hope that you come back next time for another great post!